The end result was outrageously good and quite beautiful. We devoured the cake so quickly that I barely had time to snap a decent photo, so this is the best you'll get! My entire family loved it, even my grandmother, who said it was indistinguishable from a wheat-based cake. And no one guessed it was made of beans (I didn't tell them until they had already applauded the first bites). We kept leftovers in the fridge for a couple days, and the cake was still moist and lovely. The high protein content actually makes this cake a very delicious and filling breakfast. Decadence in the morning is lovely, no? Thanks to Kelly from the The Spunky Coconut for great recipes and inspiration for this lovely, grain-free layer cake! This post is linked to Simply Sugar and Gluten Free's Slightly Indulgent Tuesday for 10/13/11. Check it out for a slew of delicious, health-conscious recipes! This cake is sweet, moist, and light, with a wonderful crumb and rich flavor. I used the Marble Cake and the Chocolate Frosting recipes from Kelly at The Spunky Coconut, and a jar of my homemade honey-sweetened strawberry jam to create a lovely cake that is perfect for birthdays, anniversaries, Valentine's Day, or any other special occasion. And since it has a such a high protein content, I think the leftovers are perfect for breakfast. Pre-heat oven to 325º F. Oil two 8-inch round cake pans, and line the base of each with a round of parchment paper. Lining the bottom of the pan with parchment makes removing the cakes from the pan a breeze! Prepare the chocolate batter first by placing beans, eggs, stevia, vanilla, honey, and coconut oil in a food processor. Puree well, then add cocoa powder, sea salt, baking soda, and baking powder, and puree until well combined and smooth. Puree well. Divide chocolate batter evenly between the two prepared cake pans. Rinse the food processor and prepare the vanilla cake. Puree the beans, eggs, stevia, vanilla, honey, and coconut oil, then add coconut flour, sea salt, baking soda, and baking powder and puree until smooth. 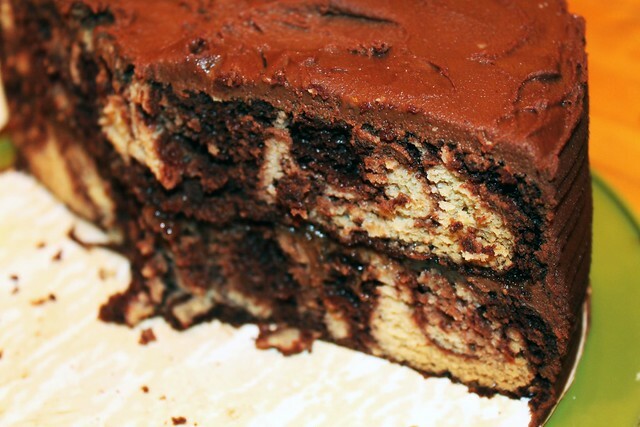 Pour the vanilla batter evenly over each chocolate layer, dividing between the two cakes. 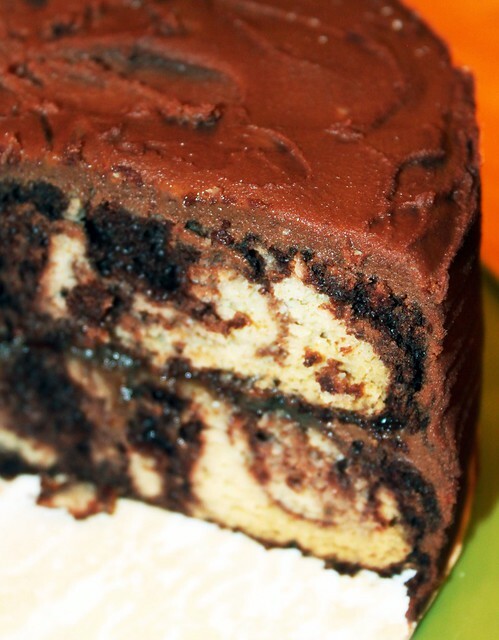 Swirl the layers, and lift some of the chocolate layer up with a fork to create the "marble" effect. Bake the two cakes at 325º F for about 30-35 minutes, then remove and cool pans on a cooling rack. If you choose to fill the cake with strawberry jam as this recipe recommends, you'll have a bit of leftover frosting to use for other treats. Otherwise, this batch should be large enough to frost the whole cake and fill between the layers. While cakes cool, melt chocolate and coconut milk together in a double boiler until chocolate is just starting to melt, then remove from heat. Add remaining ingredients and stir until smooth. Refrigerate until the frosting has cooled and thickened, around 30 minutes. If frosting still seems to thin to spread, add more coconut flour bit by bit as needed and continue to cool and thicken. I used closer to 8 tablespoons of coconut flour. Note: I used homemade honey-sweetened strawberry jam; perhaps I'll share that recipe on the blog someday! In the meantime, use your own canned jam or buy it at your local grocer. If you prefer a cane-sugar free jam, look for strawberry jams from Fiordifrutta or Bionaturae. You can find these brands at natural foods grocers and co-op, Whole Foods, well-stocked supermarkets or gourmet grocers, and various online grocery retailers. Remove the cakes from the pans. Using a large knife, slice over the top of each cake to create a flat, smooth surface. Place one layer on a plate (I recommend using the layer that has the most uneven top). Using a piping bag (or a plastic sandwich baggie with the corner cut off), pipe a thick line of frosting around the top edge of the cake layer. This round of frosting will serve as a "dam" of sorts, keeping your tasty strawberry jam filling from seeping out between the cake layers. Evenly spread the strawberry jam on the cake inside the "dam", and place the next layer of cake on the top. Straighten up the cake, ensuring that it is not leaning, press down lightly on the top layer to get everything firmly sandwiched. Spread a thin layer of frosting over the entire cake and let sit for about 15 minutes in the fridge. Then spread a thicker layer of frosting over the entire cake. Smooth frosting to your heart's desire, or leave with fun swoops and swirls. Serve immediately, or store in refrigerator until ready to serve. Remove from refrigerator at least 30 minutes before serving to come to room temperature. Note: this cake can be made one day ahead. I assembled the cake one day ahead and took it on a 6-hour car ride before serving it to my cousin, and the cake was still absolutely wonderful. It keeps well too - the refrigerated leftovers were delicious for two more days!